"Buddhism in China" redirects here. For branches of Buddhism in China other than Han Chinese Buddhism, see Tibetan Buddhism and Mahayana Buddhism. Mapping of Buddhism in China. The translation of a large body of Indian Buddhist scriptures into Chinese and the inclusion of these translations together with works composed in China into a printed canon had far-reaching implications for the dissemination of Buddhism throughout the Chinese cultural sphere, including Korea, Japan, Ryukyu Islands and Vietnam. Chinese Buddhism is also marked by the interaction between Indian religions, Chinese religion, and Taoism. Transmission of Buddhism Silk Road. Jiangnan funerary jar, ca. 250–300 CE, Jin Dynasty, decorated with a row of Buddhas seated on lotus thrones. The view that Buddhism was transmitted to China by the sea route comparatively lacks convincing and supporting materials, and some arguments are not sufficiently rigorous. Based on the existing historical texts and the archaeological iconographic materials discovered since the 1980s, particularly the first-century Buddhist manuscripts recently found in Afghanistan, the commentator believes that the most plausible theory is that Buddhism reached China from the Greater Yuezhi of northwest India and took the land route to reach Han China. After entering into China, Buddhism blended with early Daoism and Chinese traditional esoteric arts and its iconography received blind worship. White Horse Temple, traditionally held to be at the origin of Chinese Buddhism. In olden days Emperor Ming saw in a dream a god whose body had the brilliance of the sun and who flew before his palace; and he rejoiced exceedingly at this. The next day he asked his officials: "What god is this?" the scholar Fu Yi said: "Your subject has heard it said that in India there is somebody who has attained the Dao and who is called Buddha; he flies in the air, his body had the brilliance of the sun; this must be that god." The emperor then sent an envoy to Tianzhu (Southern India) to inquire about the teachings of the Buddha. Buddhist scriptures were said to have been returned to China on the backs of white horses, after which White Horse Temple was named. Two Indian monks also returned with them, named Dharmaratna and Kaśyapa Mātaṅga. An 8th-century Chinese fresco at Mogao Caves near Dunhuang in Gansu portrays Emperor Wu of Han (r. 141–87 BCE) worshiping statues of a golden man; "golden men brought in 121 BCE by a great Han general in his campaigns against the nomads". However, neither the Shiji nor Book of Han histories of Emperor Wu mentions a golden Buddhist statue (compare Emperor Ming above). The first documented translation of Buddhist scriptures from various Indian languages into Chinese occurs in 148 CE with the arrival of the Parthian prince-turned-monk An Shigao (Ch. 安世高). He worked to establish Buddhist temples in Luoyang and organized the translation of Buddhist scriptures into Chinese, testifying to the beginning of a wave of Central Asian Buddhist proselytism that was to last several centuries. An Shigao translated Buddhist texts on basic doctrines, meditation, and abhidharma. An Xuan (Ch. 安玄), a Parthian layman who worked alongside An Shigao, also translated an early Mahāyāna Buddhist text on the bodhisattva path. During the early period of Chinese Buddhism, the Indian early Buddhist schools recognized as important, and whose texts were studied, were the Dharmaguptakas, Mahīśāsakas, Kāśyapīyas, Sarvāstivādins, and the Mahāsāṃghikas. Initially, Buddhism in China faced a number of difficulties in becoming established. The concept of monasticism and the aversion to social affairs seemed to contradict the long-established norms and standards established in Chinese society. Some even declared that Buddhism was harmful to the authority of the state, that Buddhist monasteries contributed nothing to the economic prosperity of China, that Buddhism was barbaric and undeserving of Chinese cultural traditions. However, Buddhism was often associated with Daoism in its ascetic meditative tradition, and for this reason a concept-matching system was used by some early Indian translators, to adapt native Buddhist ideas onto Daoist ideas and terminology. Buddhism appealed to Chinese intellectuals and elites and the development of gentry Buddhism was sought as an alternative to Confucianism and Daoism, since Buddhism's emphasis on morality and ritual appealed to Confucianists and the desire to cultivate inner wisdom appealed to Daoists. Gentry Buddhism was a medium of introduction for the beginning of Buddhism in China, it gained imperial and courtly support. By the early 5th century Buddhism was established in south China. During this time, Indian monks continued to travel along the Silk Road to teach Buddhism, and translation work was primarily done by foreign monks rather than Chinese. When the famous monk Kumārajīva was captured during the Chinese conquest of the Buddhist kingdom of Kucha, he was imprisoned for many years. When he was released in AD 401, he immediately took a high place in Chinese Buddhism and was appraised as a great master from the West. He was especially valued by Emperor Yao Xing of the state of Later Qin, who gave him an honorific title and treated him like a god. Kumārajīva revolutionized Chinese Buddhism with his high quality translations (from AD 402–413), which are still praised for their flowing smoothness, clarity of meaning, subtlety, and literary skill. Due to the efforts of Kumārajīva, Buddhism in China became not only recognized for its practice methods, but also as high philosophy and religion. The arrival of Kumārajīva also set a standard for Chinese translations of Buddhist texts, effectively doing away with previous concept-matching systems. The translations of Kumārajīva have often remained more popular than those of other translators. Among the most well-known are his translations of the Diamond Sutra, the Amitabha Sutra, the Lotus Sutra, the Vimalakīrti Nirdeśa Sūtra, the Mūlamadhyamakakārikā, and the Aṣṭasāhasrikā Prajñāpāramitā Sūtra. Around the time of Kumārajīva, the four major Sanskrit āgamas were also translated into Chinese. Each of the āgamas was translated independently by a different Indian monk. These āgamas comprise the only other complete surviving Sūtra Piṭaka, which is generally comparable to the Pali Sutta Pitaka of Theravada Buddhism. The teachings of the Sūtra Piṭaka are usually considered to be one of the earliest teachings on Buddhism and a core text of the Early Buddhist Schools in China. Due to the wide proliferation of Buddhist texts available in Chinese and the large number of foreign monks who came to teach Buddhism in China, much like new branches growing from a main tree trunk, various specific focus traditions emerged. Among the most influential of these was the practice of Pure Land Buddhism established by Hui Yuan, which focused on Amitābha Buddha and his western pure land of Sukhāvatī. Other early traditions were the Tiantai, Huayan and the Vinaya school. Such schools were based upon the primacy of the Lotus Sūtra, the Avataṃsaka Sūtra, and the Dharmaguptaka Vinaya, respectively, along with supplementary sūtras and commentaries. The Tiantai founder Zhiyi wrote several works that became important and widely read meditation manuals in China such as the "Concise samatha-vipasyana", and the "Great samatha-vipasyana." In the 5th century, the Chán (Zen) teachings began in China, traditionally attributed to the Buddhist monk Bodhidharma, a legendary figure. [note 1] The school heavily utilized the principles found in the Laṅkāvatāra Sūtra, a sūtra utilizing the teachings of Yogācāra and those of Tathāgatagarbha, and which teaches the One Vehicle (Skt. Ekayāna) to buddhahood. In the early years, the teachings of Chán were therefore referred to as the "One Vehicle School." The earliest masters of the Chán school were called "Laṅkāvatāra Masters", for their mastery of practice according to the principles of the Laṅkāvatāra Sūtra. The Zen teaching was a separate transmission outside the scriptural teachings that did not posit any written texts as sacred. Zen pointed directly to the human mind to enable people to see their real nature and become buddhas. 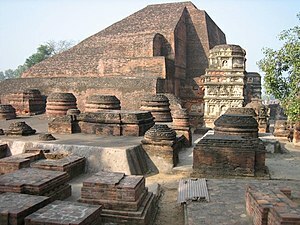 The ruins of Nalanda University in India where Xuanzang studied. The popularization of Buddhism in this period is evident in the many scripture-filled caves and structures surviving from this period. The Mogao Caves near Dunhuang in Gansu province, the Longmen Grottoes near Luoyang in Henan and the Yungang Grottoes near Datong in Shanxi are the most renowned examples from the Northern, Sui and Tang Dynasties. The Leshan Giant Buddha, carved out of a hillside in the 8th century during the Tang Dynasty and looking down on the confluence of three rivers, is still the largest stone Buddha statue in the world. Monks and pious laymen spread Buddhist concepts through story-telling and preaching from sutra texts. These oral presentations were written down as bianwen (transformation stories) which influenced the writing of fiction by their new ways of telling stories combining prose and poetry. Popular legends in this style included Mulian Rescues His Mother, in which a monk descends into hell in a show of filial piety. Making duplications of Buddhist texts was considered to bring meritorious karma. Printing from individually carved wooden blocks and from clay or metal movable type proved much more efficient than hand copying and eventually eclipsed it. The Diamond Sūtra (Vajracchedikā Prajñāpāramitā Sūtra) of 868 CE, a Buddhist scripture discovered in 1907 inside the Mogao Caves, is the first dated example of block printing. 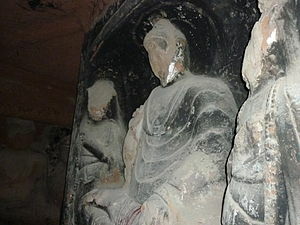 The Kaiyuan's Three Great Enlightened Masters, Śubhakarasiṃha, Vajrabodhi, and Amoghavajra, established Esoteric Buddhism in China from AD 716 to 720 during the reign of emperor Xuanzong. They came to Daxing Shansi (大兴善寺, Great Propagating Goodness Temple), which was the predecessor of Temple of the Great Enlightener Mahavairocana. Daxing Shansi was established in the ancient capital Chang'an, today's Xi'an, and became one of the four great centers of scripture translation supported by the imperial court. They had translated many Buddhist scriptures, sutra and tantra, from Sanskrit to Chinese. They had also assimilated the prevailing teachings of China: Daoism and Confucianism, with Buddhism, and had further evolved the practice of the Esoteric school. They brought to the Chinese a mysterious, dynamic, and magical teaching, which included mantra formula and detailed rituals to protect a person or an empire, to affect a person's fate after death, and, particularly popular, to bring rain in times of drought. It is not surprising, then, that all three masters were well received by the emperor Tang Xuanzong, and their teachings were quickly taken up at the Tang court and among the elite. Mantrayana altars were installed in temples in the capital, and by the time of emperor Tang Daizong (r. 762–779) its influence among the upper classes outstripped that of Daoism. However, relations between Amoghavajra and Daizong were especially good. In life the emperor favored Amoghavajra with titles and gifts, and when the master died in 774, he honored his memory with a stupa, or funeral monument. The Esoteric Buddhist lineage of China (and almost all of Buddhism in China at the time) was nearly wiped out by the Emperor Tang Wuzong, leading to the Great Anti-Buddhist Persecution. Historically, the Hanmi Chinese Esoteric School of Buddhism was also thought to have been lost when Emperor Tang Wuzong banned the teaching. Huiguo, the last known disciple of Amoghavajra, left China with Kukai traveling to Japan to establish the Japanese Esoteric school of Buddhism, later known as Shingon. A disciple of Amoghavajra, Huisu, secretly continued the lineage in China and has been passed on through one master per generation. In 1989 the 48th Maha-Acharya Master Huiling of the Chinese Esoteric School passed the teaching to the 49th Lineage Bearer Master Yu Tian Jian who revived the school. The Esoteric Buddhist lineages transmitted to Japan under the auspices of the monks Kūkai and Saicho, later formulated the teachings transmitted to them to create the Shingon sect and the Tendai sect. Blue-eyed Central Asian monk teaching East-Asian monk, Bezeklik, Turfan, eastern Tarim Basin, China, 9th century; the monk on the left is possibly Tocharian, although more likely Sogdian. There were several components that led to opposition of Buddhism. One factor is the foreign origins of Buddhism, unlike Daoism and Confucianism. Han Yu wrote, "Buddha was a man of the barbarians who did not speak the language of China and wore clothes of a different fashion. His sayings did not concern the ways of our ancient kings, nor did his manner of dress conform to their laws. He understood neither the duties that bind sovereign and subject, nor the affections of father and son." Other components included the Buddhists' withdrawal from society, since the Chinese believed that Chinese people should be involved with family life. Wealth, tax-exemption status and power of the Buddhist temples and monasteries also annoyed many critics. As mentioned earlier, persecution came during the reign of Emperor Wuzong in the Tang Dynasty. Wuzong was said to hate the sight of Buddhist monks, who he thought were tax-evaders. In 845, he ordered the destruction of 4,600 Buddhist monasteries and 40,000 temples. More than 400,000 Buddhist monks and nuns then became peasants liable to the Two Taxes (grain and cloth). Wuzong cited that Buddhism was an alien religion, which is the reason he also persecuted the Christians in China. David Graeber argues that Buddhist institutions had accumulated so much precious metals which the government needed to secure the money supply. Ancient Chinese Buddhism never fully recovered from the persecution. The Five Dynasties and Ten Kingdoms period (simplified Chinese: 五代十国; traditional Chinese: 五代十國; pinyin: Wǔdài Shíguó) was an era of political upheaval in China, between the fall of the Tang Dynasty and the founding of the Song Dynasty. During this period, five dynasties quickly succeeded one another in the north, and more than 12 independent states were established, mainly in the south. However, only ten are traditionally listed, hence the era's name, "Ten Kingdoms". Some historians, such as Bo Yang, count eleven, including Yan and Qi, but not Northern Han, viewing it as simply a continuation of Later Han. This era also led to the founding of the Liao Dynasty. After the fall of the Tang Dynasty, China was without effective central control during the Five Dynasties and Ten Kingdoms period. China was divided into several autonomous regions. Support for Buddhism was limited to a few areas. The Hua-yen and T'ien-t'ai schools suffered from the changing circumstances, since they had depended on imperial support. The collapse of T'ang society also deprived the aristocratic classes of wealth and influence, which meant a further drawback for Buddhism. Shenxiu's Northern Chán School and Henshui's Southern Chán School didn't survive the changing circumstances. Nevertheless, Chán emerged as the dominant stream within Chinese Buddhism, but with various schools developing various emphasises in their teachings, due to the regional orientation of the period. The Fayan school, named after Fa-yen Wen-i (885–958) became the dominant school in the southern kingdoms of Nan-T'ang (Jiangxi, Chiang-hsi) and Wuyue (Che-chiang). The Song Dynasty is divided into two distinct periods: the Northern Song and Southern Song. During the Northern Song (Chinese: 北宋, 960–1127), the Song capital was in the northern city of Bianjing (now Kaifeng) and the dynasty controlled most of inner China. The Southern Song (Chinese: 南宋, 1127–1279) refers to the period after the Song lost control of northern China to the Jin dynasty. During this time, the Song court retreated south of the Yangtze River and established their capital at Lin'an (now Hangzhou). Although the Song Dynasty had lost control of the traditional birthplace of Chinese civilization along the Yellow River, the Song economy was not in ruins, as the Southern Song Empire contained 60 percent of China's population and a majority of the most productive agricultural land. During the Song Dynasty, Chán (禪) was used by the government to strengthen its control over the country, and Chán grew to become the largest sect in Chinese Buddhism. An ideal picture of the Chán of the Tang period was produced, which served the legacy of this newly acquired status. In the early Song Dynasty "Chán-Pure Land syncretism became a dominant movement." Buddhist ideology began to merge with Confucianism and Daoism, due in part to the use of existing Chinese philosophical terms in the translation of Buddhist scriptures. Various Confucian scholars of the Song dynasty, including Zhu Xi (wg: Chu Hsi), sought to redefine Confucianism as Neo-Confucianism. During the Song Dynasty, in 1021 CE, it is recorded that there were 458,855 Buddhist monks and nuns actively living in monasteries. The total number of monks was 397,615, while the total number of nuns was recorded as 61,240. During the Yuan Dynasty, the Mongol emperors made Esoteric Buddhism an official religion of China, and Tibetan lamas were given patronage at the court. A common perception was that this patronage of lamas caused corrupt forms of tantra to become widespread. When the Mongol Yuan Dynasty was overthrown and the Ming Dynasty was established, the Tibetan lamas were expelled from the court, and this form of Buddhism was denounced as not being an orthodox path. According to Weinstein, by the Ming Dynasty, the Chan school was so firmly established that all monks were affiliated with either the Linji school or the Caodong school. During the Ming Dynasty, Hanshan Deqing was one of the great reformers of Chinese Buddhism. Like many of his contemporaries, he advocated the dual practice of the Chán and Pure Land methods, and advocated the use of the nianfo ("Mindfulness of the Buddha") technique to purify the mind for the attainment of self-realization. He also directed practitioners in the use of mantras as well as scripture reading. He was also renowned as a lecturer and commentator, and admired for his strict adherence to the precepts. According to Jiang Wu, for Chan masters in this period such as Hanshan Deqing, training through self-cultivation was encouraged, and clichéd or formulaic instructions were despised. Eminent monks who practiced meditation and asceticism without proper Dharma transmission were acclaimed for having acquiring "wisdom without a teacher." The Qing court endorsed the Gelukpa School of Tibetan Buddhism. Early in the Taiping rebellion, the Taiping rebels targeted Buddhism. In the Battle of Nanjing (1853), the Taiping army butchered thousands of monks in Nanjing. But from the middle of the Taiping rebellion, Taiping leaders took a more moderate approach, demanding that monks should have licences. Around 1900, Buddhists from other Asian countries showed a growing interest in Chinese Buddhism. Anagarika Dharmapala visited Shanghai in 1893, intending "to make a tour of China, to arouse the Chinese Buddhists to send missionaries to India to restore Buddhism there, and then to start a propaganda throughout the whole world", but eventually limiting his stay to Shanghai. Japanese Buddhist missionaries were active in China in the beginning of the 20th century. The modernisation of China led to the end of the Chinese Empire, and the installation of the Republic of China, which lasted on the mainland until the Communist Revolution and the installation of the People's Republic of China in 1949 which also led to the ROC government's exodus to Taiwan. Under influence of the western culture, attempts were being made to revitalize Chinese Buddhism. Most notable were the Humanistic Buddhism of Taixu, and the revival of Chinese Chán by Hsu Yun. Hsu Yun is generally regarded as one of the most influential Buddhist teachers of the 19th and 20th centuries. Other influential teachers in the early 20th century included Pure land Buddhist Yin Guang (印光) and artist Hong Yi. Layman Zhao Puchu worked much on the revival. Until 1949, monasteries were built in the Southeast Asian countries, for example by monks of Guanghua Monastery, to spread Chinese Buddhism. Presently, Guanghua Monastery has seven branches in the Malay Peninsula and Indonesia. Several Chinese Buddhist teachers left mainland China during the Communist Revolution, and settled in Hong Kong and Taiwan. 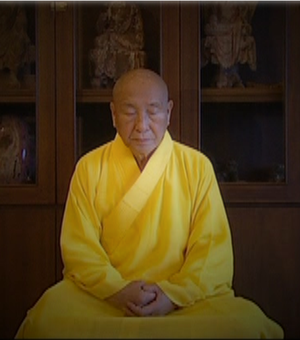 Master Hsing Yun (1927–present) is the founder of Fo Guang Shan monastery and lay organization the Buddha's Light International Association. Born in Jiangsu Province in mainland China, he entered the Sangha at the age of 12, and came to Taiwan in 1949. He founded Fo Guang Shan monastery in 1967, and the Buddha's Light International Association in 1992. These are among the largest monastic and lay Buddhist organizations in Taiwan from the late 20th to early 21st centuries. He advocates Humanistic Buddhism, which the broad modern Chinese Buddhist progressive attitude towards the religion. Master Sheng Yen (1930–2009) was the founder of the Dharma Drum Mountain, a Buddhist organization based in Taiwan. During his time in Taiwan, Sheng Yen was well known as one of the progressive Buddhist teachers who sought to teach Buddhism in a modern and Western-influenced world. Master Wei Chueh was born in 1928 in Sichuan, mainland China, and ordained in Taiwan. In 1982, he founded Lin Quan Temple in Taipei County and became known for his teaching on Ch'an practices by offering many lectures and seven-day Ch'an retreats. Unlike Catholicism and other branches of Christianity, there was no organization in China that embraced all monastics in China, nor even all monastics within the same sect. Traditionally each monastery was autonomous, with authority resting on each respective abbot. In 1953, the Chinese Buddhist Association was established at a meeting with 121 delegates in Beijing. The meeting also elected a chairman, 4 honorary chairmen, 7 vice-chairmen, a secretary general, 3 deputy secretaries-general, 18 members of a standing committee, and 93 directors. The 4 elected honorary chairmen were the Dalai Lama, the Panchen Lama, the Grand Lama of Inner Mongolia, and Venerable Master Hsu Yun. Since the reform and opening up period in the 1970s, a new revival of Chinese Buddhism has been taking place. Ancient Buddhist temples are being restored and new Buddhist temples are being built. Chinese Buddhist temples, administrated by local governments, have become increasingly commercialized by sales of tickets, incense, or other religious items; soliciting donations; and even the listing of temples on the stock market and local governments obtain large incomes. In October 2012, the State Administration for Religious Affairs announced a crackdown on religious profiteering. Many sites have done enough repairs and have already cancelled ticket fares and are receiving voluntary donation instead. The 108-metre-high Guan Yin of the South Sea of Sanya statue was enshrined on April 24, 2005 with the participation of 108 eminent monks from various Buddhist groups from Mainland China, Hong Kong, Macao and Taiwan, and tens of thousands of pilgrims. The delegation also included monks from the Theravada and Tibetan Buddhist traditions. China is one of the countries with the most of the world's highest statues, many of which are Buddhist statues. In April 2006 China organized the World Buddhist Forum, an event now held every two years, and in March 2007 the government banned mining on Buddhist sacred mountains. In May of the same year, in Changzhou, the world's tallest pagoda was built and opened. In March 2008 the Taiwan-based organizations Tzu Chi Foundation and Fo Guang Shan were approved to open a branch in mainland China. Currently, there are about 1.3 billion Chinese living in the People's Republic. Surveys have found that around 18.2% to 20% of this population adheres to Buddhism. Furthermore, PEW found that another 21% of the Chinese population followed Chinese folk religions that incorporated elements of Buddhism. Chinese Buddhism is mainly practiced by ethnic Han-Chinese in Southeast Asia. The first Chinese master to teach Westerners in North America was Hsuan Hua, who taught Chán and other traditions of Chinese Buddhism in San Francisco during the early 1960s. He went on to found the City Of Ten Thousand Buddhas, a monastery and retreat center located on a 237-acre (959,000 m²) property near Ukiah, California. Chuang Yen Monastery and Hsi Lai Temple are also large centers. Sheng Yen also founded dharma centers in the USA. In China and countries with large Chinese populations such as Taiwan, Malaysia, and Singapore, Esoteric Buddhism is most commonly referred to as the Chinese term Mìzōng (密宗), or "Esoteric School." Traditions of Chinese Esoteric Buddhism are most commonly referred to as referred as Tángmì (唐密), "Tang Dynasty Esoterica," or Hànchuán Mìzōng (漢傳密宗), "Han Transmission Esoteric School" (Hànmì 漢密 for short), or Dōngmì (東密), "Eastern Esoterica," separating itself from Tibetan and Newar traditions. 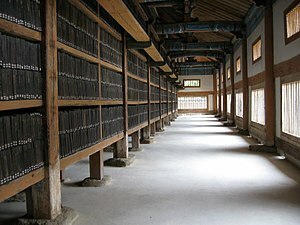 These schools more or less share the same doctrines as Shingon, and in some cases, Chinese monks have traveled to Japan to train and to be given esoteric transmission at Mount Koya and Mount Hiei. Chinese Buddhism incorporates elements of traditional Buddhism and Taoism. During the Zhou dynasty, Chinese believed that smoke resulting from burning wood act as a bridge between the human world and the spirits. When Buddhism reached China, this wood evolved into sandalwood incense which were originally burned by Indian Buddhists so they could concentrate better. It can be seen that incense burning as it is known today is a merger between Chinese culture and Buddhist culture. Lay Buddhists at the recitation hall (诵经堂 sòngjīngtáng) of the Temple of the Six Banyan Trees in Guangzhou, Guangdong. In Chinese Buddhism, lay practitioners have traditionally played an important role, and lay practice of Buddhism has had similar tendencies to those of monastic Buddhism in China. Many historical biographies of lay Buddhists are available, which give a clear picture of their practices and role in Chinese Buddhism. In addition to these numerous biographies, there are accounts from Jesuit missionaries such as Matteo Ricci which provide extensive and revealing accounts to the degree Buddhism penetrated elite and popular culture in China. Traditional practices such as meditation, mantra recitation, mindfulness of Amitābha Buddha, asceticism, and vegetarianism were all integrated into the belief systems of ordinary people. It is known from accounts in the Ming Dynasty that lay practitioners often engaged in practices from both the Pure Land and Chán traditions, as well as the study of the Buddhist sūtras. The Heart Sūtra and the Diamond Sūtra were the most popular, followed by the Lotus Sūtra and the Avataṃsaka Sūtra. Laypeople were also commonly devoted to the practice of mantras, and the Mahā Karuṇā Dhāraṇī and the Cundī Dhāraṇī were very popular. Robert Gimello has also observed that in Chinese Buddhist communities, the esoteric practices of Cundī enjoyed popularity among both the populace and the elite. Mahāyāna figures such as Avalokiteśvara Bodhisattva, Kṣitigarbha Bodhisattva, Amitābha Buddha, and the Medicine Buddha, were all widely known and revered. Beliefs in karma and rebirth were held at all levels of Chinese society, and pilgrimages to well-known monasteries and the four holy mountains of China were undertaken by monastics and lay practitioners alike. These are the holy days that Chinese Buddhists celebrate by visiting temples to make offerings of prayers, incense, fruits, flowers and donations. On such days they observe the moral precepts very strictly as well as a full day's vegetarian diet, a practice originally from China. The dates given are based on the Chinese calendar system so that 8.4 means the Eighth day of the fourth month in Chinese calendar and so on. Some traditions specifically describe Bodhidharma to be the third son of a Tamil Pallava king from Kanchipuram, while the Japanese tradition regards Bodhidharma to be from Persia. ↑ Ji Zhe (2011). "复兴三十年：当代中国佛教的基本数据" [Three Decades of Revival: Basic Data on Contemporary Chinese Buddhism]. Archived from the original on 27 April 2017. ↑ Hill (2009), p. 31. ↑ Jerry Bentley "Old World Encounters: Cross-Cultural Contacts and Exchanges in Pre-Modern Times" (New York: Oxford University Press, 1993), 78. ↑ "Archived copy". Archived from the original on 2013-05-28. Retrieved 2013-07-29. ↑ Dumoulin 2005, p. 85–90. ↑ 18.0 18.1 Dumoulin 2005, p. 88. ↑ 20.0 20.1 20.2 20.3 McRae 2003, p. 26. ↑ Dumoulin 2005, p. 89. ↑ Kambe & (year unknown). ↑ Zvelebil 1987, p. 125–126. ↑ Basic Buddhism: exploring Buddhism and Zen, Nan Huai-Chin, 1997, Samuel Weiser, page 92. ↑ See Eli Franco, "Xuanzang's proof of idealism." Horin 11 (2004): 199–212. ↑ "Diamond Sutra". Landmarks in Printing. The British Library. Archived from the original on 2005-03-06. Retrieved 2008-09-12. ↑ For information on the Sogdians, an Eastern Iranian people, and their inhabitation of Turfan as an ethnic minority community during the phases of Tang Chinese (7th–8th century) and Uyghur rule (9th–13th century), see Hansen, Valerie (2012), The Silk Road: A New History, Oxford University Press, p. 98, ISBN 978-0-19-993921-3. ↑ Graeber, David (2011). Debt: The First 5000 Years. Brooklyn, NY: Melville House. pp. 265–6. ISBN 978-1-933633-86-2. ↑ History of Spreading Archived May 12, 2013, at the Wayback Machine. ↑ Welter 2000, p. 86–87. ↑ Ebrey 2006, p. 167. ↑ McRae 1993, p. 119–120. ↑ 43.0 43.1 43.2 Nan Huai-Chin. Basic Buddhism: Exploring Buddhism and Zen. York Beach: Samuel Weiser. 1997. p. 99. ↑ 49.0 49.1 Huai-Chin 1999. ↑ Voice of Longquan, Guanghua Monastery Archived December 18, 2012, at the Wayback Machine. ↑ Holmes, Welch (1961). "Buddhism Under the Communists", China Quarterly, No.6, Apr-June 1961, pp. 1–14. ↑ Erica B. Mitchell (201), A Revival of Buddhism? Archived July 14, 2014, at the Wayback Machine. ↑ "China bans mining on sacred Buddhist mountains". Reuters. 2007-08-23. ↑ "China temple opens tallest pagoda". BBC News. 2007-05-01. Retrieved 2010-04-27. ↑ Tzu Chi Foundation Approved To Open Branch In Mainland China - ChinaCSR.com - Corporate Social Responsibility (CSR) News and Information for China Archived July 5, 2008, at the Wayback Machine. ↑ 70.0 70.1 70.2 70.3 70.4 70.5 70.6 70.7 70.8 Munro (1994), p. 269–271. ↑ 71.0 71.1 71.2 Dui Hua, issue 52, 29 August 2013: The "Cult" of Buddha. Munro, Robin; Mickey Spiegel (1994). Detained in China and Tibet: A Directory of Political and Religious Prisoners. Human Rights Watch. ISBN 1564321053. Wikimedia Commons has media related to Buddhism in China. 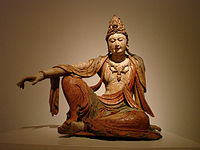 This article includes content from Chinese Buddhism on Wikipedia (view authors). License under CC BY-SA 3.0. This page was last edited on 3 October 2018, at 07:37.